Come celebrate the new year at ABV! The party will be ringing all night with great beers, awesome food, and great music. Come down to ABV on Thursday October 13th as we tap 5-6 beers from Industrial Arts Brewing. Dine Out for Life at ABV! Make AIDS history! DINE OUT FOR LIFE on 10/11 and 25% or more of your bill goes to fight HIV/AIDS in Buffalo & WNY! On Thursday, September 29th, Great Lakes is bringing two Barrel Aged offerings & others to Allen Burger Venture for Buffalo Beer Week. Come Celebrate Buffalo Beer Week on Sunday, October 2nd with Allen Burger Venture and East Aurora’s 42 North Brewery. What are you doing for pride this year? Come to ABV and party with us and the NINJA RUGBY CLUB!! Local vendors, music, art, beer tent, smash burgers, games and more! BYOV (bring your own vinyl) and Dr. Ooo will spin it for you! Receive $1 Off Craft Beers & Specialty Cocktails when you bring in your record! Join us on Sunday, May 1st to celebrate our One Year Anniversary with an indoor and outdoor celebration. Family fun begins at 11:00am to 3:00pm, but the party goes all night! BYOV (Bring Your Own Vinyl) to ABV this Saturday, April 16th. Dr.Ooo aka DJ Less Fabric will be spinning your records all day! Receive $1 off all beers and cocktails when you bring in your record. Join us during Local Restaurant Week for some amazing $20.16 deals! Pick any one of the burgers on the restaurant week menu, any local draft beer, and you get to take home your own Chow Monstro pint glass! Join us during the St. Patricks Day Parade on Sunday, March 20th from 12:00pm to 2:00pm. Enjoy live entertainment provided by The Tullamore Dew Girls, we’ll also have beer and shot specials. So what if its Valentines and your single? Don’t piss about it, lets dance about it! The party starts at 9:00pm on Sunday, February 14th, this is a 21 and up event with no cover charge, limited space. Artist Series Pint Glass & Burger Special featuring our very own Chow Monstro. Try the new CHOW MONSTRO BURGER! It includes a complimentary Artist Series pint glass. Check back monthly to see who will be our next featured artist! WANT TO HOST YOUR OWN ABV SUPER BOWL TAKE OVER? Have your Super Bowl 50 party @ ABV on Sunday February 7th 5:30pm-10:30pm! At $45 per person that would include open bar, bar snacks, and you get to keep your ABV custom pint glass! Don’t forget to check out our Facebook page for more events and specials! MUSIC. ART. FASHION. ICON. LEGEND. RIP David Bowie you have been an inspiration to us all. Thank you for the soundtrack to our lives. Come in this week and try one of our David Bowie themed specials. Click here to view the menu. 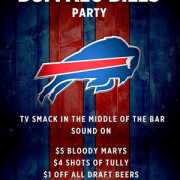 Yo Buffalo, not going to the game?! Get down to ABV for every 2015-2016 Buffalo Bills game. 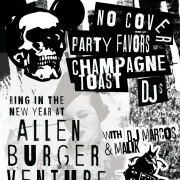 Ring in the New Year at ABV! Welcome in 2016 at Allen Burger Venture! Thursday, December 31st at 10pm, we’ll have party favors, a champagne toast, and music from DJ Marcos & Malik. 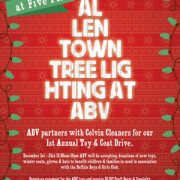 1st Allentown Tree Lighting at ABV! Sunday December 6th at 5pm. Bring your friends and family to this wonderful community event!